The problem of inspiration is simply to be fully alive at a given moment when working. And so, temperatures are dropping outside, I have put on an extra layer of clothing, and the garage/man cave ambience is quite nice again. I am starting this painting by blocking in the dark shadows, trying to build the contrast early. I’m also looking again at a myriad of Andrew Wyeth drybrush paintings the same size as this 28 x 22″ composition, and noting how large his dark areas are, in contrast to mine. I’m enthusiastic about the potential of this one, and fascinated with the multitude of details it offers. It flies in the face of sound judgment, but at 11:00 tonight I decided to put on a pot of coffee, while temperatures outdoors slid down to 35 degrees. I finished my school responsibilities about fifteen minutes ago, and I really do not wish to retire to bed with this 28 x 22″ watercolor sheet lying blank on my drafting table, it just seems so wrong. So . . . with my second cup of coffee half-drained, and Andrew Wyeth’s voice coming over the TV (listening to “The Real World of Andrew Wyeth”), I gaze at this composition, and wonder how to begin drawing it, and how exactly to block in the deep shadows. Unlike my last large still life, I want this one to be a darkened composition, in hopes that I can find my way toward the Andrew Wyeth-style dim interiors that I love so much, and so far have not been able to accomplish. Most men talk a good game of a-man’s-got-to-do-what-a-man’s-got-to-do, but when they get a little bit lonely they get clingy and pitiful. . . . We are not on this earth for long. Part of what a midlife crisis is about is figuring out what gives you pleasure and doing more of that in the time you have left without asking for permission or a financial or emotional subsidy from anyone else. 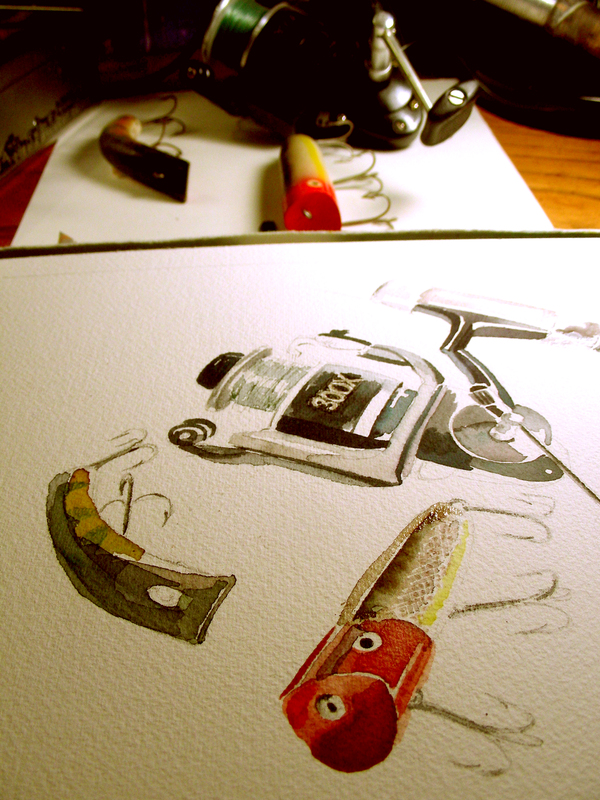 I find it astonishing that my winter watercolor explorations have taken me completely out of the loop of fly fishing. In Texas, rainbow trout are stocked in area waters throughout the winter months, and this season I have gone out with my fly rod only once. And yet, I find myself in the man cave, making these repeated attempts to watercolor flies, vintage lures, assorted rods & reels, and various other pieces of fishing equipment. Friends have been very encouraging with these recent sketches, so I figured I was ready to launch a full-size watercolor of this subject. I have always believed in my heart that nothing is more powerful than an idea whose time has come, and I have yet to be disappointed when I respond to such a powerful impetus to go after a particular composition. I couldn’t wait to get started on this project after school. 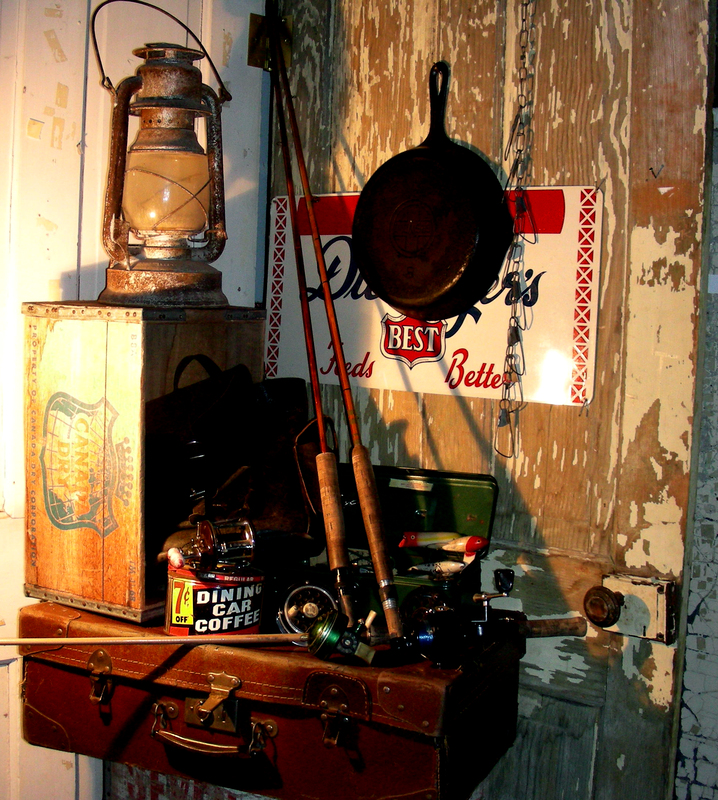 I traveled to north Fort Worth to borrow an assortment of vintage fishing reels from a criminal defense lawyer. I was referred by a friend, and having never met the man before, my heart was instantly warmed when he offered me a fresh cup of coffee and congenial conversation, despite his demanding work on an upcoming trial. I wish I could have stayed longer, but he had his work ahead of him, and frankly, so did I. He is a passionate fly fisherman, and I genuinely hope for an opportunity to go out on the waters with him someday. Meanwhile, I am grateful for his willingness to lend me these vintage pieces for assembling this new composition. If I can make up my mind that I have this composition set and ready, I will begin drawing tonight. The only thing that still hovers about annoyingly are the grades due for progress reports at midnight tonight. I still have papers to grade and grades to post online. Damn. At any rate, I wanted to give any interested readers a “sneak preview” of what I want to go after next. I would like to tackle a 28 x 22″ watercolor of this subject (or one similar–the objects are still getting up and walking around when I leave the cave to do some other chore). The history of literature . . . is a sum of very few ideas and of very few original tales; all the rest being variation of these. And so, this afternoon I thought myself clever to spin off the Cartesian dictum cogito ergo sum (“I think, therefore I am”) with my own pingo ergo sum (“I paint, therefore I am”). But . . . not only has this been thought before, it has its own website and established following. Oh well. I still feel the ring of authenticity in the statement: I paint, therefore I am. And so, as I paint in the cave this afternoon, aware of the threatening weather outside (darkening skies, plummeting temperatures and hard-driving rain), I muse over my painting, why I do it, what I am contributing, how much of it is actually distinct in style, or perhaps even new, and then I come back to reality–it is harder now than ever to create something “new” in art. But that is not why I paint. I paint to relax, to remember, and to enjoy the exhilaration of watching something emerge from a white rectangular vacuum, beneath the puddle of water before me, much like a photographer in a dark room, only it is I who am creating this picture, not snatching it from the observable world though a lens and transferring it to film. And if I am ever successful in creating an authentic picture of an old man rising to make his coffee in the morning, amid modest surroundings, then perhaps I can paint in words as well. The beginning and end of all literary activity is the reproduction of the world that surrounds me by means of the world that is in me, all things being grasped, related, recreated, moulded and reconstructed in a personal form and an original manner. My recent interest in still life painting arose when I realized I was spending much of my idle time staring at objects collected that remind me of my upbringing. Years ago, in an antique store in Fort Worth, Texas, I found and purchased a pair of Jadeite Fire King coffee mugs, my eye delighting in seeing those celadon green colors that used to greet me in the mornings of my childhood. I went out searching for those mugs in antique stores, because I enjoyed so much the motion picture Pollock, starring Ed Harris, when it was first released. There are two scenes in the film where the actors are drinking from those mugs in humble kitchens, one in New York City, the other in Springs, Long Island. The percolator I purchased at an old re-sale shop in Kennedale, Texas. I wanted to put a percolator on my stove top burner and listen for the percolating sounds that I so enjoyed as a child. 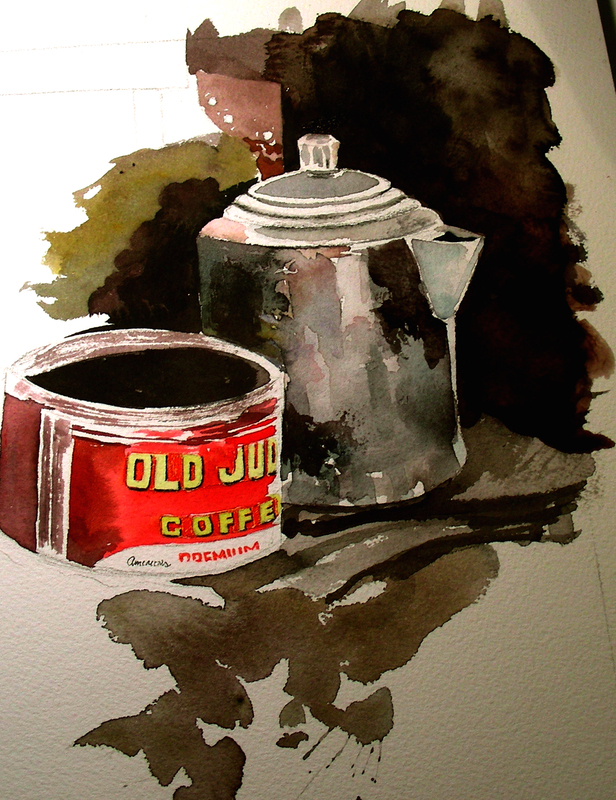 And the aroma of the coffee steaming from that old percolator, wow! I must admit that I have yet to make a decent-tasting cup of coffee from it, but at least I can enjoy the sounds and the smells! Proustian. I am trying to finish this small 8 x 10″ composition. 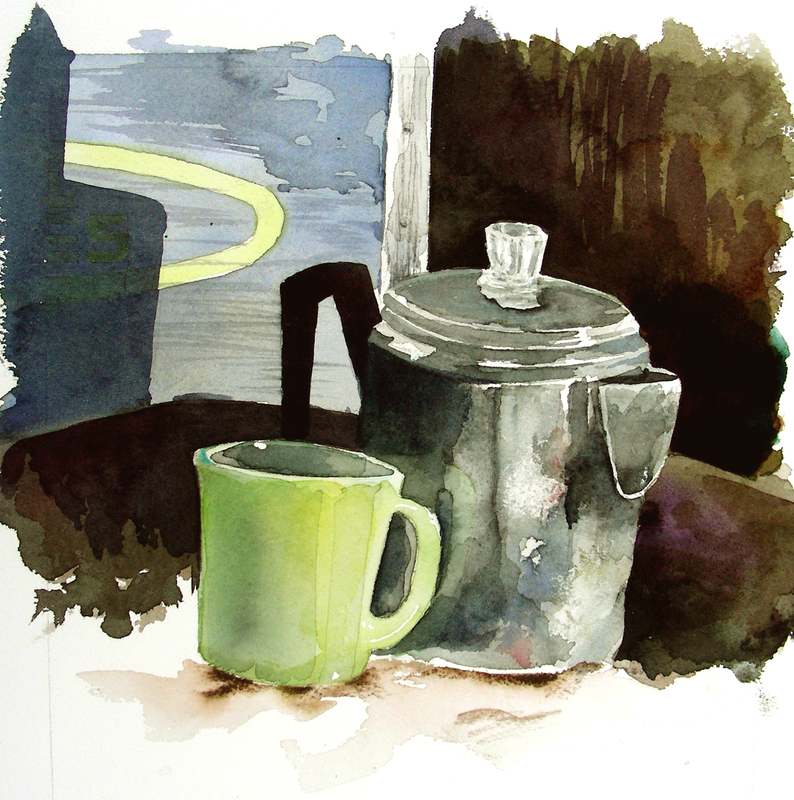 I’m not sure how to make the mug and percolator emerge except to continue darkening the backgrounds that frame them. 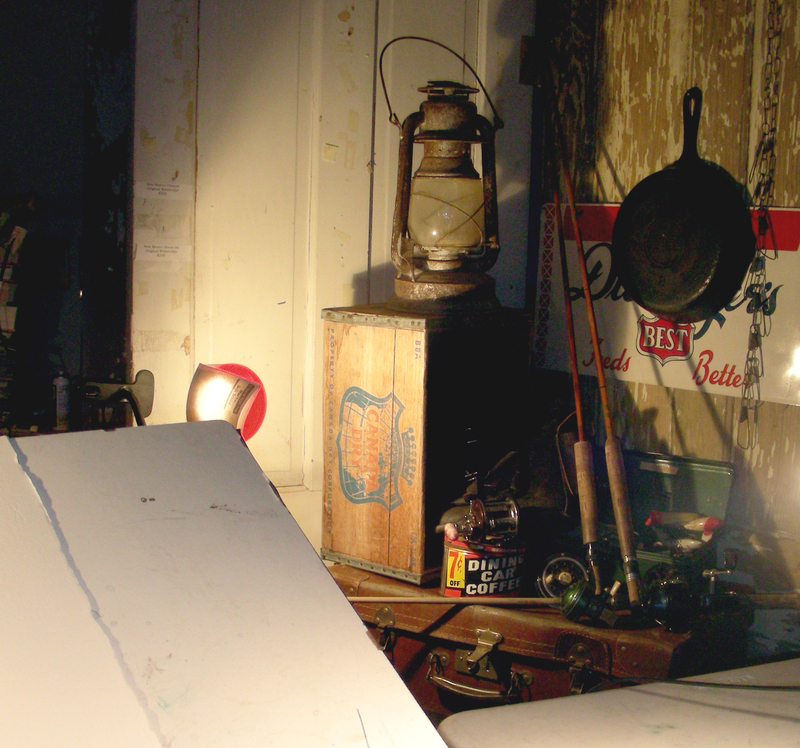 In many ways, I am flying blind as I attempt to solve still-life compositions. I don’t write this in frustration, but in fascination–it’s a new world, and I’m glad to be ranging about in it. I wish I could live to be 500, there is so much to learn about watercoloring and composition. And I’m loving every minute of this. I cannot regard myself as a frustrated artist at this point. Last night’s arctic blast clothed the weathered old man in an icy shroud that he sought to shed. The patchwork quilt draped over his sagging shoulders hung like a duster down to his knees as he shuffled across the uneven wooden floor of his front room. Holding his favorite Jadeite mug in both hands, he waited patiently for the gurgle to commence within his stove-top percolator. In just a few minutes, the sun would be cresting the distant range to the east, and he wanted to worship Aurora this morning with an open book in his lap and fresh coffee in his mug. On this day he had much to remember. Today would be a day for remembering. As the percolator hissed, steamed and finally began its chortling, his memory was carried back to a cold, pre-dawn morning in the small, cramped kitchen of a spare urban apartment. It was 4:30 a.m. He had only slept two-and-a-half hours, the result of another all-night study and preparation for his Humanities class that would begin at 7:35. He still had to dress, eat, walk three blocks to catch a bus, connect with a commuter train, and meet his morning class. He was only thirty-seven, but already felt that he was seventy-two and worn down by life. 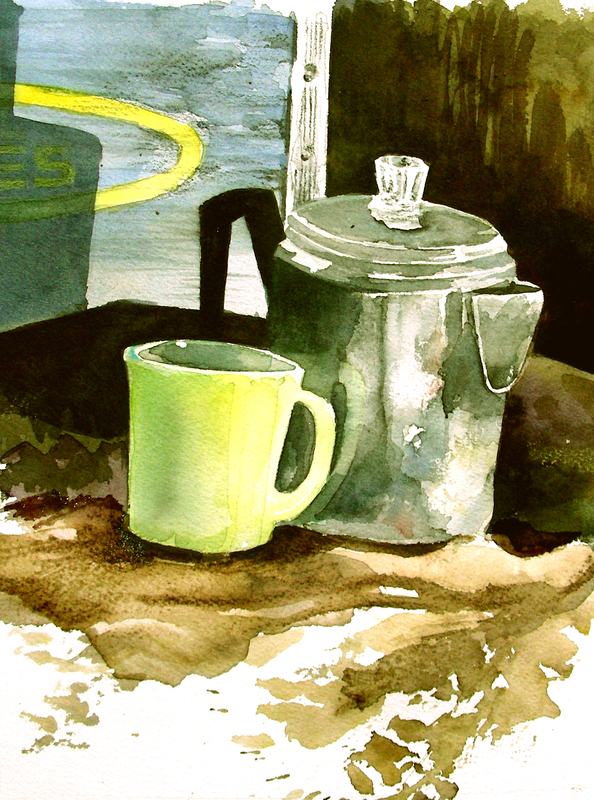 He stood beside his small stove, staring at the stove-top percolator he had taken on many a camping excursion, waiting. Looking up from the percolator that seemed to be contemplating whether or not to bubble, his eyes ranged over the pile of books, manila folders and hand-drafted notes taken the night before. Hoards of writers and artists from the neo-classical and romantic persuasions, all struggling for his attention. How on earth was he going to synthesize all this information within the next three hours? All he could hope for was a percolating mind in synergy with the percolating coffee–but right now this just wasn’t happening. As he stood, contemplating, vignettes drifted through his consciousness, remembrances of graduate study, of seminars, conversations in the study carrels and coffee shops of those days, mornings in the park with a soul-mate and late nights of discussions when ideas were born as muses stirred and whispered their affirmations. And then the coffee was ready. 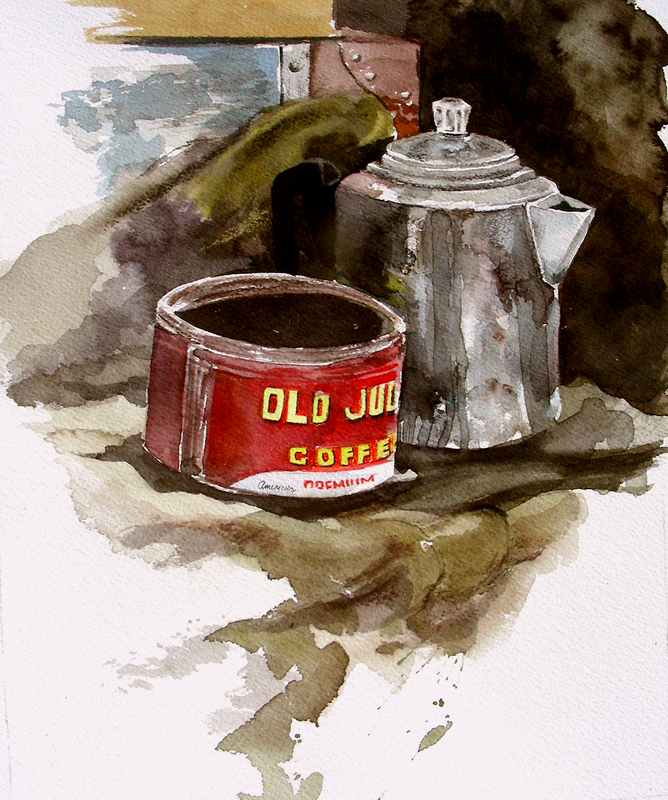 As the solitary old man poured the brew, inhaling with delight the aroma, he couldn’t quite discern what it was that he was feeling this morning–contentment or melancholia. He couldn’t determine whether the memories were filling him or emptying him. And he wondered: is memory something you have or something you have lost? By now, maybe some of my readers are wondering what is going on with these snippets of stories of an old man waking up to coffee. These are just my attempts at writing fiction. I have had these stories floating in my mind for over a decade, and wondered what to do as I began writing them out. So, I decided, why not just fling them out on the blog as well? Right now, there are probably some tears on this painting in progress. I often enjoy playing VHS tapes on my small TV in the man cave, or listening to a DVD on the laptop. While painting this, I’ve been listening to Neil Young playing and singing “Bandit” at his solo performance of Greendale at Vicar Street in Dublin. The song is about a painter. And I am not crying out of depression, just a fullness of feelings (if that makes sense)–a good cry, actually, a cleansing cry. I feel a real connection as I hear this song and meditate on the words. Neil Young has done a lot of that for me over the decades. It is turning out to be a good night. I would give anything to return to the studio today and take up the next painting–I already have a still life assembled and waiting for me. But alas, my job–progress grades are due soon and I have devoted this entire day to teaching, grading, and inputting grades for six classes covering four different subjects (ugh). I also have a scheduled meeting to attend, and business commitments later in the day. And then there are the preparations for tomorrow’s classes, and a major Academic Decathlon responsibility that I have for Saturday. I am not sure when I will get to return to the studio. Not today, and perhaps not tomorrow either. The way things look now, I may not even see the inside of my Man Cave until late Saturday. I’ll be ready. Meanwhile, I don’t want to stop blogging. So I pause today to give thanks to an art teacher who made a difference in my life from the time of my sophomore year in high school. Leo Hoeh was an articulate man, with a vocabulary that challenged my mental laziness (I had almost zero interest in intellectual exploration throughout my high school years). 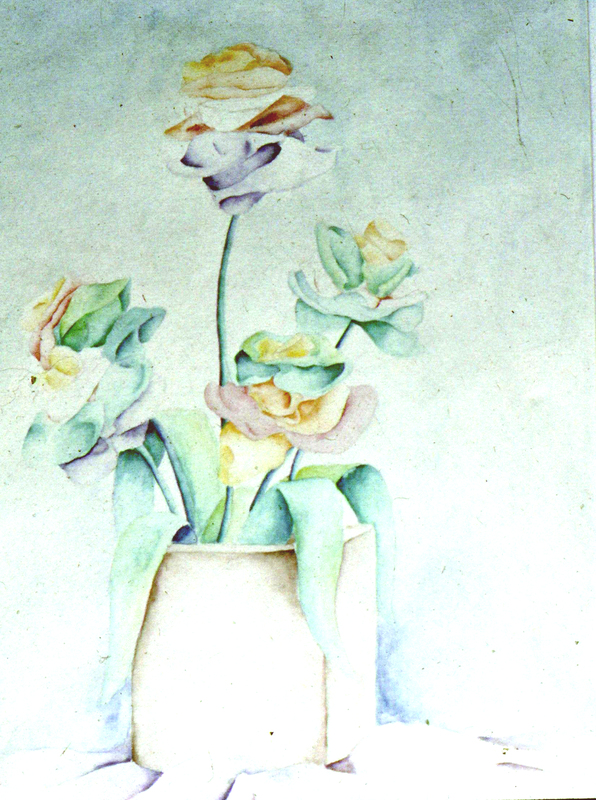 What caught my attention was Mr. Hoeh’s facility in handling the watercolor medium. He taught us to soak and stretch watercolor paper over canvas stretchers, using a staple gun. I thought this was normal until my university years and the years following, when many people expressed their surprise at my working on stretched watercolor paper. I cannot thank Mr. Hoeh enough for demonstrating that method of preparation. When I use paper lighter than 300-lb., I prefer it stretched. It dries so much more quickly than the watercolor block, and I love the spring that I feel on the surface when I am drawing, or working vigorously with the brush, or scrubbing it. There is a dynamic there that cannot be described. I just love it. I still recall my fascination when watching Mr. Hoeh demonstrate before the class. He made it look so easy, working wet-on-wet, the colors billowing about in the puddles of wash. And he could do the most amazing things with India ink on the moistened paper (I never could, and still cannot). He encouraged us to welcome accidents, to learn to accommodate them, to be flexible while going through the process of wet-on-wet watercoloring. I struggled with the medium, failing again and again, but the patience of this teacher was boundless. He never seemed displeased or concerned. He just gently prodded me on, urging me to stay with it, to believe in it, and above all, to keep the sketchbook growing with new ideas. He was the first art teacher to show interest in my sketches of the farm where my grandparents resided, and he especially focused on my grandfather’s old dwelling, that I have painted repeatedly throughout my career. The photo posted above began as a 35mm print, then was later copied onto a 35mm slide, and then later scanned and Photoshopped. 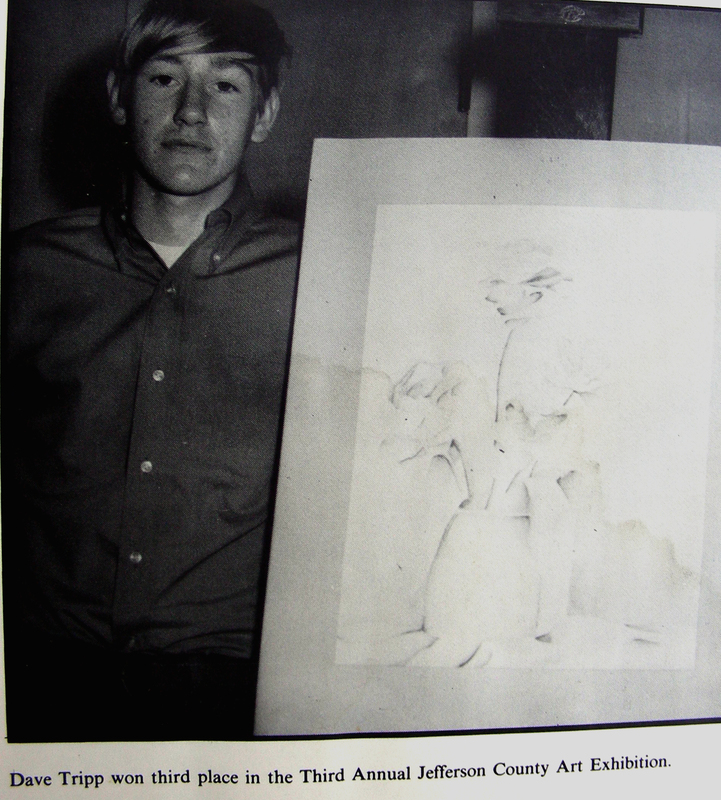 This is about the best I can do in restoring the image of a painting done in 1970 when I was in Art II. Mr. Hoeh had set up an arrangement of papier-mache flowers on wire stems, sticking out of a brick. I was scared to death of the composition, drawing the petals of the flowers, re-drawing, and re-drawing some more, afraid to approach them with watercolor. I found the Prang set of pigments very unforgiving (like Andrew Wyeth, I found the green totally repugnant), and I had no idea how to model the petals in color. Finally, I surprised myself when I laid down a pure pigment on the dry paper, wet the brush, and then dragged the color to the side, watching it gradually pale. One petal was all it took. Then I was hooked. I got it. And yes, this painting was totally controlled, totally lacking in spontaneity, but it thrilled me to see that I could transition from the rich intensity of a color to its gradual paleness, and finally to white, with no sudden shifts or creases. The longer I worked on this, the more I hated to see it draw to a conclusion. Mr. Hoeh entered a number of our works into a local exhibition/competition at Jefferson County Junior College. One evening I received a phone call from the Chairman of the Art Department, notifying me that I had placed third, would be awarded a ribbon and a $10 check. I was only in the tenth grade, and I was overwhelmed. When my parents took me to the reception, we were greeted by Mr. Hoeh in the lobby, who smilingly pointed to a wire sculpture of a mosquito dangling from the ceiling with the first place ribbon hanging from its feet. “That was what beat all of us,” he smilingly said. We just rolled our eyes. Thank you, Mr. Hoeh, for believing in me, and giving me the confidence that I could “solve” watercolor. I wish I had told you this much earlier in life. And thanks to the rest of you for reading. Rising gingerly from his wooden rocker, the old man clumped across the wooden plank flooring of the front room, stroking and digging at the small of his back beneath the faded blue flannel shirt. Must have slept crooked last night. He continued to gouge his strong fingers into the ache buried deep within his frame. The kitchen was in its usual untidy array of coffee mugs, cups & saucers, stoneware bowls and scattered appliances. Reaching for the percolator, he began to refill his mug with his preferred refried coffee. It was a return to simplicity. The old man didn’t even drink coffee until his preacher days in college, didn’t even learn to use a percolator until he was thirty, bought his first Mr. Coffee at thirty-three, graduated to the cafe-style Bunn coffee brewer at forty, and began grinding beans five years after that. And now, at seventy-two, he was drinking Old Judge out of a stove-top percolator, sometimes boiling a handful of coffee grounds with broken egg shells in a kettle not once, but twice, stirring, and drinking refried coffee. He did this to savor the memory of his earlier days camping in the Cascade Mountains of Oregon. . . Within the ramshackle Missouri farmhouse, an aged, graying man stretched in his chair next to the smoking, wood-burning stove. Squinting out the window into the first rays of a piercing sunrise, he watched as the shafts of winter light lanced the mists that played across the broad gray surface of the Mississippi River. Neelys Landing was still sleeping, but the man continued to watch for the town’s first waking sights. As the sunlight glanced off the curvature of his celadon green Fire King mug, he slowly and delicately sipped the Old Judge Coffee brew, delighting in the hot moist aroma that caressed his weathered cheeks. What was so familiar about that smell? Of course! Mount Hood Coffee. The aroma-induced recollection brought the pleasant shock of recognition, suddenly sweeping him back forty years, and away seventeen hundred miles, to an Oregon morning walk that marked the turning point of his life. Suddenly, neither the time or the distance was significant. Everything was rolling up to the shores of his consciousness, like the surging tides of the Pacific Northwest . . . The three-day weekend has offered so many gifts to me, and so many pleasures, as I immersed myself in quality reading and took advantage of several opportunities to enter the studio. Tonight, after the school preparations were made, I withdrew to the Cave and resumed this watercolor sketch I began early this morning. As stated in earlier blogs, I am poring over a collection of Andrew Wyeth drybrush watercolor sketches of dim interiors, and am trying to find a way to break away from the light that has bathed my watercolor compositions for years. I honestly do not know how to paint a dark composition, with light playing on only an object or two. I’m finding this a very difficult adjustment, but am intrigued with what I’ve already discovered today. D’Arches watercolor paper is so exceedingly bright and reflective, that I feel as though I am violating its properties by working over the surface with glaze after glaze of dark colors, seeking to drive away the light. 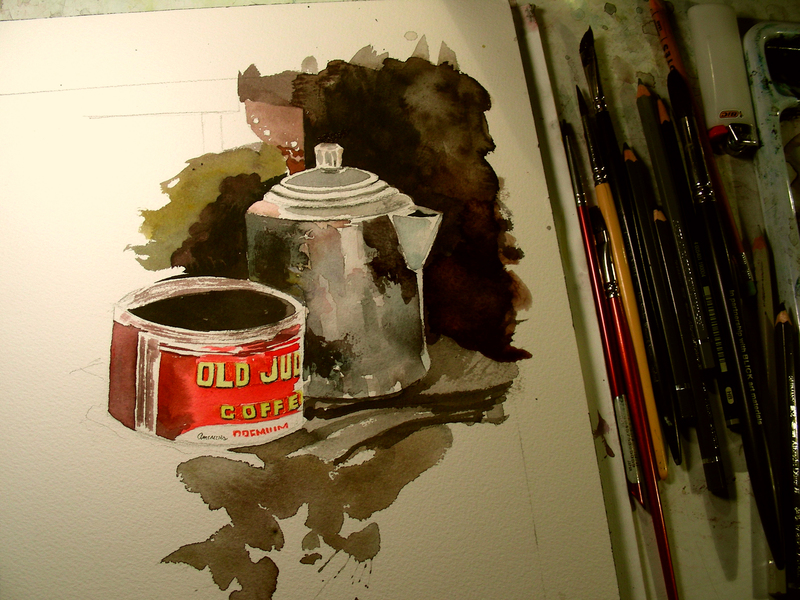 Tonight, I worked the reds and yellows into the coffee can, and now have to figure out how to deepen and darken the can, except for the small part that catches the light. The same issues arise from the percolator, which sits in the semi-darkness, and has very little highlighting present on its surface. I’ll be intrigued to see how this one shapes up in the days ahead. A painting covers its tracks. Painters work from the ground up. The latest version of a painting overlays earlier versions, and obliterates them. This is my reason for posting in-progress watercolors on my blog; I want to reveal my watercolor endeavors as works under construction. And when a painting is finished, I spend plenty of time poring over my photographs taken of the painting as it underwent the stages of construction. For several days now, I have been looking at this old tackle box overflowing with vintage lures, wondering over what kind of rod & reel to put with them. I’m not yet finished with this “fishing” series, but this evening I took my Garcia Mitchell 300 open-face reel off the display wall of my study and decided to build a small composition around it. 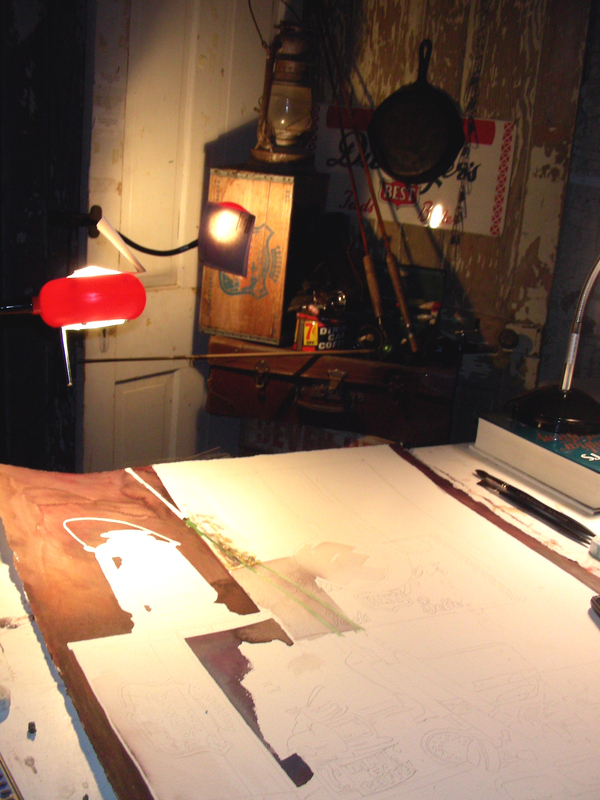 By the time I finished laying out this trio of objects and masking off an 8 x 10″ area on my watercolor block, I was ready to crank out a blockbuster watercolor. The youth gets together his materials to build a bridge to the moon, or perchance a palace or temple to the earth, and at length the middle-aged man concludes to build a wood-shed with them. Now, ninety minutes after beginning, I look at this “sketch” and in the Thoreauvian sentiment, acknowledge that my moon-bridge has become a mere wood-shed, but nevertheless a preliminary study for a larger, more finished painting. Though the work has fallen below my preliminary expectations, I would not have traded this evening’s quiet studio experience for anything. Andrew Wyeth said he would work for weeks on preliminary sketches, drybrush watercolors and fragments of compositions, knowing that the “communion” from these encounters would find its way into the final composiiton. I’m not sure yet what kind of “fishing painting” lies just around the bend (if any), but this evening provided a nice quiet space in my holiday weekend for making art, for studying these small objects, for experimenting with a few new color combinations, and exploring new techniques in drawing and watercolor.